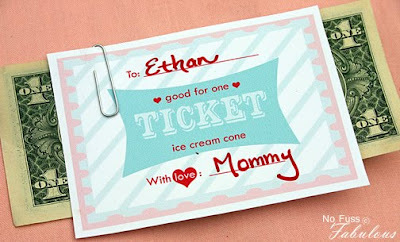 These super cute ice cream cone tickets would be the perfect treat for me, wait I mean my kiddos! We love to take walks to get an ice cream cone (kind of feels like it evens out if you walk there right?) and I think it would make it extra special for the kids to be able to buy their own! Ice cream is one of the easiest ways to my heart, but even more than ice cream...I love flip flops! Yep, this was the "gag gift" portion of my birthday gift from Sandy. She bought one of every color the store had. So not a gag...in fact I think you can expect to see me in one of these pairs all summer long (right after I exchange the size...for some reason she thought I have tiny, dainty feet. Thanks for that!!). In fact it was so warm today, I was thinking about starting flip flops season right now! enjoy your pretty colored flip flops!!!! !